We combined everything and within a day or two the flavors combine, but this is in no way a mild version. 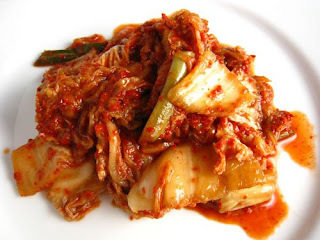 Without the fermentation that true kim-chi has, this recipe overpowers things with spice. I have not used it, but I have observed a product on the shelf of the Asian market called ‘kim-chi base’ Which I’m guessing is like a dressing for cabbage. My basic pickle recipe is equal parts sugar, water, and vinegar. I use white distilled vinegar for stronger/longer pickles like whole gherkins, or garlic. I like to use rice wine vinegar in the same ratio for quicker, pickles, especially if you are adding vegetables to a hot liquid. For instance, you have to melt the sugar into a liquid whether that is water or vinegar, or both. So if I need to soften a vegetable, like cauliflower with heat, I like to use rice wine vinegar. If I am cutting anything, like a julienne of carrot, then I know I have to cool the pickle liquid or the vegetables with be overcooked by heat. This can be done quickly by heating the sugar with the vinegar then making an ice slushy out of the water part. This pickle with give you a good balance of bitter and sweet, but there is more to it. I like to add as a base spice, cinnamon, clove, and coriander. It’s best to use whole spices bound in cheesecloth as not to turn your pickle a putrid brown. Juniper, pepper flakes, cumin, and cardamon all have there place depending on the object of the pickle. Melt sugar into vinegar and add spices to hot liquid, combine everything else cold, and chill for 3 days, then go at it!